I've been easing into using my new Cricut. I must admit, I'm still not sure how it's going to fit into my scrapbooking style. I know it will, but I'm still trying it on for size. One thing I know, is that I'm not feeling the lettering for use on pages. I love my Thickers and letter stickers so much, I just can't envision replacing them. What I did discover while I was doing this page for the die cut challenge at Practical Scrappers is that die cuts can be a fun way to add oomph to my titles without sacrificing those yummy stickers. I LOVE this layout. I also love my Cricut...and bought it to make titles. But I use it mainly for cards....and titles are still stickers and chipboard! OMWord, what precious photos!!! Love your title and colors!! Beautiful layout Erin!!! I have to agree with you on the letters... I can't get them to cut clean when I use my cricut, and they end up tearing..
Erin I love this LO!! The clouds as cookies --GENIUS!! Absolutely adorable!! This is such a cute layout!! I saw it over at Practical Scrappers. I love how you made the cookies out of clouds. Thats so creative and such a good idea!! This is fantastic! The dp is wonderful, and those pictures remind me so much of my eldest daughter. She loved wearing her food as as hair accessories. Great LO, Erin! Those PPs are gorgeous and your little one is beyond cute! It took me a while to get into my Cricut, so give yourself time and you'll find it a wonderful contribution to your scrap stash! How adorable! And your idea to use the clouds for the cookies is great! That's one of the wonderful things about the cricut. It's much more versatile than you think at first. The more you play with it, the more you'll love it! 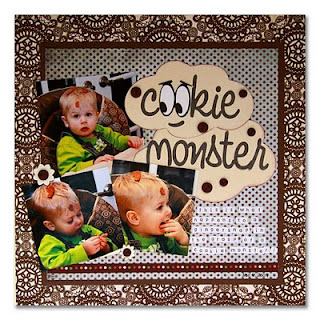 love the page - those diecuts in cookie are too cute!